Find hotel near Shankheswar Parsvanath Ja .. 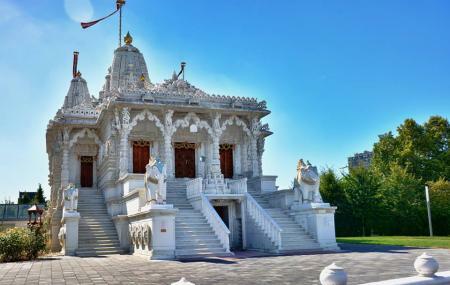 The temple located in the Laarstraat of Antwerp beholds a sacred piece of India within it. Over the past few decades, the city has seen many Jains settled and living their lives here. The temple is somewhat of a reflection of their identity and more than that, a reflection of the sentiments of unity among folks. The magnificent temple is not only of the largest of its kind in Europe but also depicts the various aspects of this religion. Built by native Jain diamantaires, the stunning structure is the fruits of years of hard work, dedication and faith. Come here to admire its architecture or delve into its spiritual vibes. A few hours spent amidst its spiritual ambience is unlike anything you will ever experience. No photos to be taken inside. Shoes must be kept outside. No food or drinks are allowed in the temple. Love this? Explore the entire list of places to visit in Antwerp before you plan your trip. Fancy a good night's sleep after a tiring day? Check out where to stay in Antwerp and book an accommodation of your choice. How popular is Shankheswar Parsvanath Jain Temple? People normally club together Aahaar and De Muze while planning their visit to Shankheswar Parsvanath Jain Temple. Feeling blessed .feel the peace touching your soul. Antwerp is like cool breeze that you feel on your half sweaty face while you cycle in-and-around this lovely city. We were essentially enjoying the perfect demarcation on the roads with separate free galleries for cycles when I offered my wife to start from the Antwerpen Centraal and take a look around finally circling a circuit close to 20 kms back to the start. I wanted to give a surprise check point to her as she is a jain and had no clue about this peaceful place. It can be difficult to spot but I have put a pic of the entrance board below. The entrance looks small but later opens up to an expanse. Be careful about the timing you may want to read online if you wish to catch the evening aarti.